The increasing investment in smart power technologies is the primary factor boosting the global power system analysis software market. Apart from this, advancements in Big Data analytics and Internet of Things is also a major factor boosting the demand for power system analysis software. Furthermore, energy conservancy property of the software is gathering the attention of governments across the world for long-term energy security, which is another factor fuelling the market’s growth. The power system analysis software market is highly fragmented with the presence of several local players. However, a handful of companies, namely General Electric Company, ABB Ltd., and Siemens AG have established themselves via mergers and acquisitions and strategic alliances with domestic players. For example, in 2016, General Electric Company acquired Alstom and has been making huge investments in India to build smart cities, mission critical facilities, process industries, and government operations. The global power system analysis software market stood at a valuation of US$3,540.4 mn in 2015 and is expected to be worth US$10,245.6 mn by 2024 rising at a CAGR of 12.6% between 2016 and 2024. In terms of implementation, the global market for power system analysis software is divided into on-premise and cloud-based models. Of the two, on-premise led the market in 2015 accounting for almost 82% revenue of the overall power system analysis software market. The on-premise implementation segment is expected to rise at a CAGR of 12.3% between 2016 and 2024. The on-premise model offers better system uptime as servers are owned and maintained at the power utilities’ buildings, which is one of the key factors for the lead position of the segment. The power system analysis software market report provides analysis for the period 2015–2025, wherein the period from 2017 to 2025 is the forecast period and 2016 is the base year. The report covers all the major trends and technologies playing a key role in power system analysis software market growth over the forecast period. It also highlights the drivers, restraints, and opportunities expected to influence market’s growth during the said period. 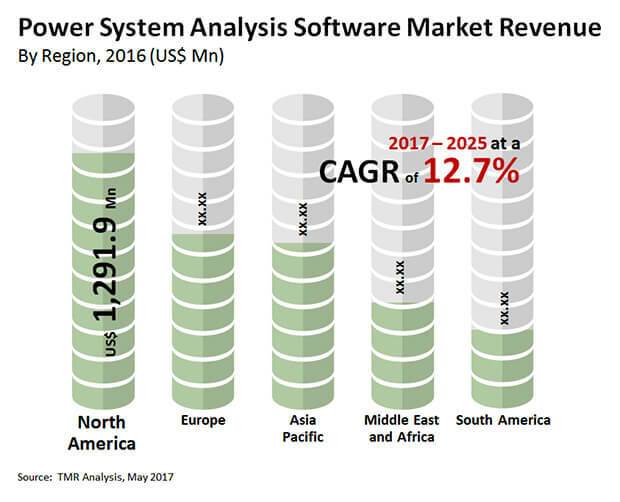 The study provides a holistic perspective on the power system analysis software market’s growth throughout the above mentioned forecast period in terms of revenue (in US$ Mn), across different geographies, including Asia Pacific, Latin America, North America, Europe, and Middle East & Africa (MEA). The market overview section of the report demonstrates the market dynamics and trends, such as the drivers, restraints, and opportunities that influence the current nature and future status of this market. An attractiveness analysis has also been provided for every geographic region in the report, in order to give a thorough analysis of the overall competitive scenario of the w power system analysis software market, globally. Moreover, the report provides an overview of the various strategies of key players present in the market. Product definition and introduction chapter helps in understanding different technologies of power system analysis software along with their applications which are included in the report. The report also highlights the competitive landscape of the power system analysis software market, thereby positioning all the major players according to their geographic presence and recent key developments. The comprehensive power system analysis software market estimates are the result of our in-depth secondary research, primary interviews, and in-house expert panel reviews. These market estimates have been analyzed by taking into account the impact of different political, social, economic, technological, and legal factors along with the current market dynamics affecting the power system analysis software market’s growth. The report segments the global power system analysis software market on the basis of implementation model into on-premise and cloud -based. By application, the market has been classified into distribution and transmission. Thus, the report provides in-depth cross-segment analysis of the power system analysis software market and classifies it into various levels, thereby providing valuable insights at the macro as well as micro levels. On the basis of geography, North American market is divided into the U.S., and Rest of North America. Similarly, Europe market is divided into EU7, CIS, and Rest of Europe. Asia Pacific has been segmented into Japan, China, South Asia (India, Pakistan, Bangladesh, and Sri Lanka), Australasia (Australia, NZ, and Guinea), and Rest of Asia Pacific. Middle East and Africa covers the G.C.C., South Africa and Rest of Middle East and Africa. Similarly, Latin American region includes Brazil, and Rest of Latin America. This report provides all the essential information required to understand the power system analysis software and its components. Also, the report provides insights related to the policies and regulations according to the various geographical regions mentioned above. These policies and regulations are directly or indirectly influencing the power system analysis software market. ABB Ltd., Siemens AG, General Electric Company, Schneider Electric DMS NS, ETAP/Operation Technology, Inc., Atos SE, Artelys SA, PSI AG, Operation Simulation Associates, Inc., Unicorn Systems, Energy Exemplar, Electricity Coordinating Center Ltd., PowerWorld Corporation, Open Systems International, Inc., Nexant Inc., Electrocon International Inc., Pöyry, DIgSILENT GmbH, Eaton Corporation Plc, and Neplan AG. are some of the major players operating within the global power system analysis software market profiled in this study. Details such as financials, business strategies, recent developments, and other such strategic information pertaining to these players have been duly provided as part of company profiling. The global power system analysis software market is segmented as follows.